WHITTIER – Whittier Union High School District has been selected as one of three Bright Spot honorees by The Education Trust-West for advancing equity, closing opportunity and achievement gaps and strengthening the pipeline to college for traditionally underrepresented students. Whittier Union was recognized along with Pasadena City College and Chula Vista Elementary School District at Ed Trust-West’s 2018 Education Equity Forum in September for demonstrating a commitment to excellence and implementing strategies and practices that generated positive outcomes for students of color, low-income students, English learners and first-generation college students. Ed Trust-West – the Oakland-based office of the nationally recognized Education Trust in Washington, D.C. – advocates for educational justice and the high academic achievement of students in pre-k through college, particularly those of color and those living in poverty. The forum aimed to bring together equity-driven and student-focused education leaders to learn about new and best practices for supporting student achievement – an arena in which Whittier Union has achieved tremendous success. Most students at Whittier Union – 88 percent – are Latino. More than seven in 10 students are low income and almost one in 10 are English learners. Still, about 55 percent of seniors complete the a-g course sequence of classes required for college entrance – 8 percentage points higher than the state average. A-g completion rates for Latino students are almost 15 percentage points higher at Whittier Union than for Latino students statewide. And in 2017, the District had a 97 percent graduation rate and 94 percent of students made progress on the state School Dashboard’s EL Progress Indicator. For nearly two decades, the District has intentionally created systems and structures to meet the needs of students and carefully analyzed data to understand which students are succeeding in college prep courses and which need additional support. Each campus uses the data to refine practices to support student success and expand college and career readiness opportunities. For instance, each school has its own bell schedule and college-bound program, such as Advancement Via Individual Determination (AVID) or Puente, to reflect students’ needs and ensure they have access to embedded supports during the school day. Every student is also automatically enrolled in the 15-course a-g sequence required for college admissions starting in ninth grade. Educational teams meet regularly to find best practices to support English learner students and developed common grading practices. Despite the instructional differences of each school, they all provide students with the same expectations, curriculum, assessments and opportunities. 102918_WUHSD_BRIGHTSPOT: Whittier Union High School District in September was selected as a Bright Spot honoree by The Education Trust-West for advancing equity, closing opportunity and achievement gaps and increasing college access to traditionally underrepresented students, including students of color, low-income students, English learners and first-generation college students. Pictured are members of the Spanish 2 Best Practices team, one of many collaborative teams across the District that contribute to student success. Whittier Union High School District in September was selected as a Bright Spot honoree by The Education Trust-West for advancing equity, closing opportunity and achievement gaps and increasing college access to traditionally underrepresented students, including students of color, low-income students, English learners and first-generation college students. 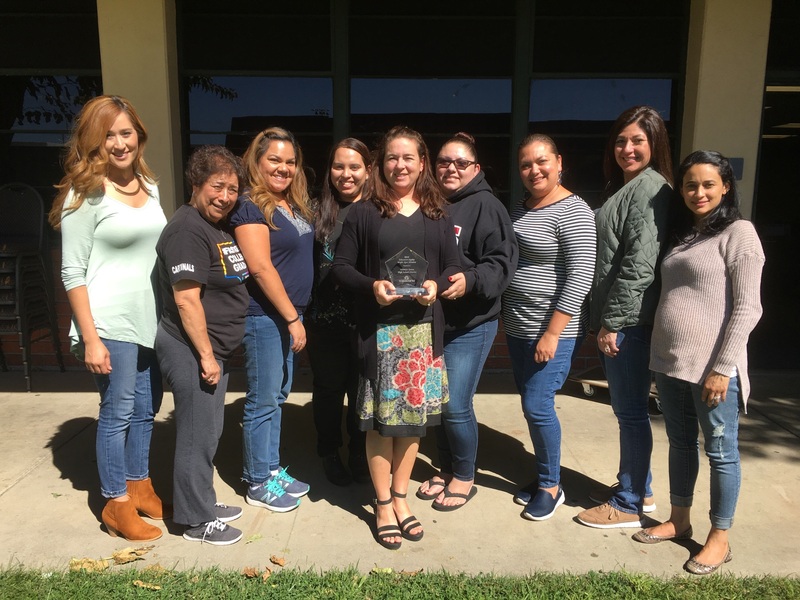 Pictured are members of the Spanish 2 Best Practices team, one of many collaborative teams across the District that contribute to student success.